The RT1079 Security Door Intercom System easily installs at any entry point to enable visitors to announce their arrival. The long range performance of the RT1079 allows radio-equipped personnel to receive the call from anywhere in the building and instantly answer back using a portable 2-way radio or desk-top base station intercom. The RT1079 helps increase efficiency and maintain security by allowing exterior doors to remain locked. Workers can remain focused and productive until they receive an intercom call. Wasted time is reduced and deliveries and pick-ups are handled more quickly. With he innovative two-part system only the rugged, all-metal speaker intercom box is mounted on the outside of the facility. The radio transceiver mounts safely inside the facility to provide optimal radio signal coverage to radio-equipped personnel and where it is well protected from vandals and the weather. Compatible with our other MURS radios. A UHF version is also available. The approximate range of the system is 350,000sq. ft and additional range can be achieved with the optional remote mount antenna. 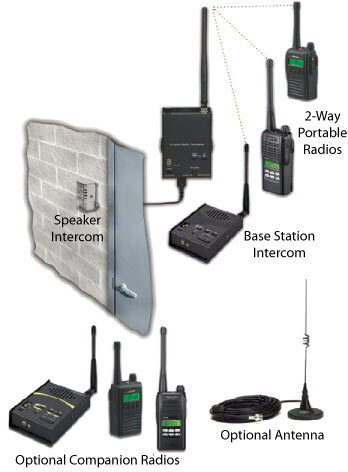 System includes: transceiver with mounting bracket, antenna, AC adaptor, external speaker, intercom box and 20' of connecting cable. Improved Security -Secured doors can remain locked. Doors no longer need to be unlocked, propped open or "manned" by a person to permit authorized entry. Increased Employee Productivity -Employees can remain productive while also monitoring activity at any door, right from their portable 2-way radio or desktop base station. Eliminates Missed Deliveries -Permits instant communication from delivery drivers and visitors directly to radio-equipped personnel inside the facility. Helps Maintain Busy Schedules -Instant communication enables coordination and quick response time. Simple-To-Install -One 20ft. long cable easily connects the radio to the rugged exterior speaker intercom box. Unique Call-Tone -A unique Call Tone differentiates a RT1079 call from any other radio call. Callbox Mode: Prevents eavesdropping at the speaker. Speaker turns OFF after a period of inactivity. Always-On Mode: Incoming calls are always heard on the speaker. Ideal for warehouse and factory floor applications. Business Band Frequencies-The transceiver can be field-programmed to a set list of table frequencies, or with programming software, can be PC programmed to be compatible with virtually any other VHF or UHF 2-way radio system, even radio repeaters with the UHF version. Conduit Connections: Conduit can be attached through back or bottom. Mounting Options: (2) Built-in Side Flanges or via holes in back cover. DOC Canadian Approved Models also available.